1. Work : کام : (noun) activity directed toward making or doing something. What work do you have with me? I went for some work. Whose work is this ? I had gone for some work. How did you like my work ? I work in my own way. I also had to work on EID. I just went out for work. I came to you for a work. Ok, work is being done. She checked several points needing further work. 2. Work, Do Work : کام کرنا : (verb) be employed. Do you want to work after the age of 60 ? She never did any work because she inherited a lot of money. She works as a waitress to put herself through college. Serve - do duty or hold offices; serve in a specific function. 3. Work, Function, Go, Operate, Run : کام کرنا : (verb) perform as expected when applied. This old radio doesn`t work anymore. 4. Work, Workplace : کام کرنے کی جگہ : (noun) a place where work is done. He arrived at work early today. Bakehouse, Bakery, Bakeshop - a workplace where baked goods (breads and cakes and pastries) are produced or sold. 5. Work, Bring, Make For, Play, Wreak : لانا - کرنا : (verb) cause to happen or to occur as a consequence. 6. Work, Put To Work : کام کرانا : (verb) cause to work. He is working his servants hard. Warm Up - cause to do preliminary exercises so as to stretch the muscles. 7. Work, Crop, Cultivate : فصل اگانا - کاشت کاری کرنا : (verb) prepare for crops. Agriculture, Farming, Husbandry - the practice of cultivating the land or raising stock. 8. Work, Act Upon, Influence : زیر اثر : (verb) have and exert influence or effect. The artist's work influenced the young painter. Affect, Bear On, Bear Upon, Impact, Touch, Touch On - have an effect upon. 9. Work, Forge, Form, Mold, Mould, Shape : بنانا - ڈھالنا : (verb) make something, usually for a specific function. Work the metal into a sword. Carve - form by carving. 10. Work, Knead : گوندھنا : (verb) make uniform. Work the clay until it is soft. Masticate - grind and knead. 11. Work, Exploit : فروغ دینا - قابل ذکر بنانا : (verb) use or manipulate to one's advantage. She knows how to work the system. He works his parents for sympathy. Apply, Employ, Use, Utilise, Utilize - put into service; make work or employ for a particular purpose or for its inherent or natural purpose. 12. Work, Figure Out, Lick, Puzzle Out, Solve, Work Out : مسئلہ حل کرنا : (verb) find the solution to (a problem or question) or understand the meaning of. Work out your problems with the boss. 13. Work, Ferment : خمیر کرنا : (verb) cause to undergo fermentation. The vintner worked the wine in big oak vats. Ferment, Sour, Turn, Work - go sour or spoil. 14. Work, Ferment, Sour, Turn : خراب ہونا : (verb) go sour or spoil. Ferment, Work - cause to undergo fermentation. Textbook of Work Physiology: Physiological Bases of Exercise. Direct Social Work Practice: Theory and SkillsThe Implicit Function Theorem: History, Theory, and Applications. Work Day : کام کا دن : a day on which work is done. Wordily : بڑے دم سے : in a verbose manner. How this page explains Work ? It helps you understand the word Work with comprehensive detail, no other web page in our knowledge can explain Work better than this page. 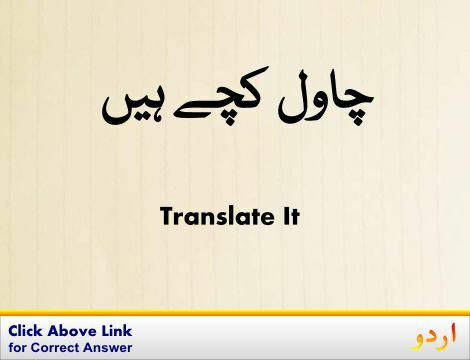 The page not only provides Urdu meaning of Work but also gives extensive definition in English language. The definition of Work is followed by practically usable example sentences which allow you to construct you own sentences based on it. You can also find multiple synonyms or similar words on the right of Work. All of this may seem less if you are unable to learn exact pronunciation of Work, so we have embedded mp3 recording of native Englishman, simply click on speaker icon and listen how English speaking people pronounce Work. We hope this page has helped you understand Work in detail, if you find any mistake on this page, please keep in mind that no human being can be perfect.